In this video, Dr. Huntoon discusses How to Keep Your Gallbladder and why having it out will only create a life-time of health issues you and your doctor will never relate to having your Gallbladder removed. And your Medical Doctor will never tell you the FULL TRUTH of what you are agreeing to by having your Gallbladder removed. If you are told you have Gallstones and to remove your Gallbladder, before you actually do that, call Dr. Huntoon and have a consultation with him FIRST. The gallbladder is a small organ that sits under the liver. The gallbladder aids in digestion by storing bile produced by the liver. After meals the gallbladder will empty this bile into the small intestine to aid in digestion. Before meals the gallbladder is full and about the size of a small pear. After meals it will shrink to the size of a deflated balloon. You will feel a pain in the upper right, or middle of your abdomen about 30-60 minutes after eating a meal. This pain may spread over time to the back or shoulder and generally lasts a couple hours. Spicy or greasy meals are the most common trigger of an attack, but any meal may prove to be a trigger. This will always be called Gastritis by your Medical Doctor and will probably be prescribed antacids, proton-pump inhibitors (PPI's) or other medications. This will always make the condition worse over time. This will lead to Gallbladder attacks if not properly addressed. Gallbladder attacks are classified into two groups based on severity. What may have happened is a gallstone might have become lodged in the tubing connecting the gallbladder to the pancreas. In the first group once the gallstone becomes unstuck it falls back into the gallbladder and the pain slowly subsides. In the second group the gallstone fails to dislodge on its own, the pain does not cease without medical attention. If untreated it can lead to fever, chills, or a serious infection. I received a piece of mail from "Premier Health" which represents an informational magazine of the Premier Medical Group of the Hudson Valley in New York. It was very professionally done and looked like the information could be really important to the average reader. After all, why else would the Premier Medical Group of the Hudson Valley take the time to put this out, if it was not important? I am always intrigued by Traditional Allopathic Medicine and I do my best to read up to date information about the latest "cutting" edge understanding the Medical and Pharmaceutical Industry have come up with; after all, they have way deeper pockets than I have, and their ability to come up with different "Treatments" to common health conditions always helps me understand these conditions better. So I read the one article highlighting Salvatore M. Buffa, M.D. and the titled "What You Need To Know About Your Gallbladder." The first highlighted portion of the article said, "Nearly 1 million new cases of gallbladder and gallstone disease are diagnosed every year in the U.S. Yet most of us don't even know why the little pear-shaped organ is there." The article never did address why the organ is there, but it did offer a solution for gallbladder and gallstone disease. Read on. I was quite interested to find that according to the article, "If you have frequent gallbladder attacks, you may be advised to have your gallbladder removed, one of the most common surgeries performed in the U.S. Luckily, the gallbladder is a non-essential organ, and you'll do fine without it and very fine without the pain of gallstones." that having gallbladder surgery is one of the most common surgeries performed in the U.S. My natural question immediately is, "Just because it is 'one of the most common surgeries,' does that make it O.K.?" What is Allopathic Medicine and the Pharmaceutical Industry doing to research why this is such a common surgery in the U.S.? My second question naturally is, "Why did GOD give us this 'non-essential' organ?" 1. Laparoscopic cholecystectomy was introduced at a professional surgical society meeting in late 1989. By 1992, 85% of all cholecystectomies were performed laparoscopically. 2. There was an associated increase of 30% in the number of cholecystectomies performed. 3. Because of the increased volume of gallbladder operations, their total cost increased 11.4% between 1988 and 1992, despite a 25.1% drop in the average cost per surgery. 4. The mortality rate for gallbladder surgeries did not decline as a result of the lower risk because so many more were performed. 5. 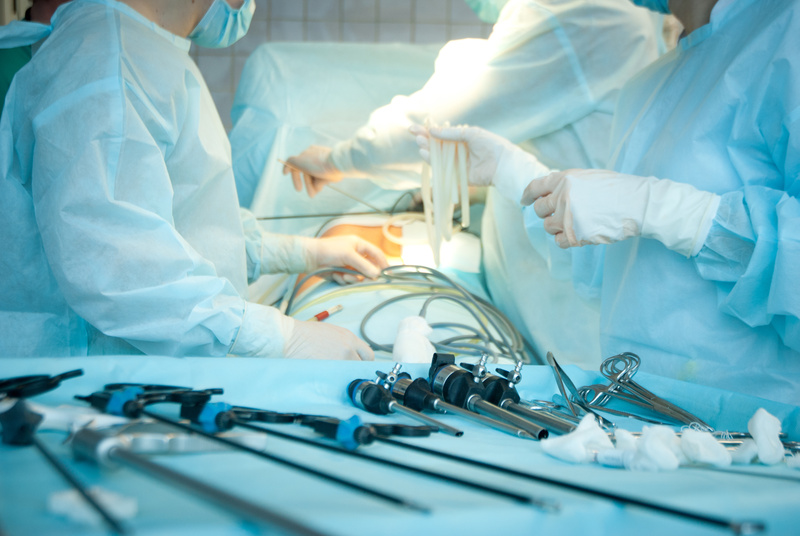 When studies were finally done on completed cases, the results showed that laparoscopic cholecystectomy was associated with reduced inpatient duration, decreased pain, and a shorter period of restricted activity. But rates of bile duct and major vessel injury increased and it was suggested that these rates were worse for people with acute cholecystitis. No clinical trials had been done to clarify this issue. 6. Patient demand, fueled by substantial media attention, was a major force in promoting rapid adoption of these procedures. 7. The major manufacturer of laparoscopic equipment produced the video that introduced the procedure in 1989. 8. Doctors were given two-day training seminars before performing the surgery on patients. Your gallbladder is necessary for helping you break down your fat. Fat is necessary for stopping inflammation and for building hormones. If you cannot sufficiently breakdown your fat, you will have too much inflammation and will develop hormone imbalances. Could these be a reason why the Medical Profession and the Pharmaceutical Industry have not come up with solutions for this organ called the gallbladder? Your gallbladder is what helps to regulate your digestive system, how your body breaks foods down, absorbs and assimilates the ingredients for the purposes of health. any other digestive concerns, please consider what comes next. According to Traditional Chinese Medicine and everything I have found over the past 27 years of practice, your gall bladder is the area of the body that helps to make decisions. Most people think the brain is where decisions are made, but from a physiological perspective, research indicates that the neuro-peptides related to your ability to make decisions are found and stored in your gallbladder. What's also interesting is your ability to plan and organize your thoughts is carried around on neuro-peptides that are found and stored in your liver. And the two of these organs are paired in Traditional Chinese Medicine and are categorized as the Wood Element, one of the 5 Elements in the 5 Element Theory of Health. Why Do I Bring These Emotions Up? Simple. We are emotional beings and yet we have spent years being taught that it is improper to show our emotions, especially if they are going to make others uncomfortable, or if we might embarrass ourselves or other by showing them. Well, that being common, I'm sure as common as, or more so than one of the most common surgeries performed on this "non-essential" organ, the suppressed or unexpressed or repressed energy associated with all of those emotions will lead to gallbladder pathology. If you are failing to express the true feelings you have about a spouse, child, co-worker or life circumstance that causes you to feel any of the emotions listed, either all of the time or even just some of the time, this will lead to gallbladder disease and gallbladder pathology. Now, certainly you could have one of the most common surgeries done every year in the U.S., and you could have this 'non-essential' organ removed, and then what? Meaning what do you do now to know that you are suffering from stuffed emotions? Having the indicator of the imbalance removed does not get rid of the imbalance. The CAUSE IS STILL THERE!! The Symptoms were expressed by the gallbladder. Failing to address the underlying cause, the emotional imbalances, does nothing to help the patient other than allowing the problem to get bigger. For about 8 months I was dealing with headaches, nausea and right side abdominal discomfort. After discovering that I had a poorly functioning gallbladder, my gastroenterologist recommended surgery. After meeting with Dr. Huntoon, he made ...More"For about 8 months I was dealing with headaches, nausea and right side abdominal discomfort. After discovering that I had a poorly functioning gallbladder, my gastroenterologist recommended surgery. After meeting with Dr. Huntoon, he made me realize that several different factors regarding my health attributed to my gallbladder issue. Since seeing him, I have not had the same constant discomfort or the headaches and nausea I'd experienced previously. I also appreciate how accessible he is by phone or by email. Traditional doctors just do not take the time to look at underlying issues. As well-meaning as they may be, in my experience they look for a quick fix in terms of prescribing medicines, tests and/or surgery. I'm very grateful to Dr. Huntoon for taking the time to understand my issues and educate me on understanding them myself." I have had several patients over the years that have come to me after they have had their gallbladder removed. Each and every one of them still has issues with their health. True, their gallbladder doesn't bother them anymore, yet they still have digestive issues and are on at least one (usually more than one) medication for the rest of their lives. And the best part about it is the liver, which is the other half of the Wood Element, now has to be able to filter and detoxify the medications, which continues to create stress on the Hepatic, Digestive and Hormonal Systems of the patient. Ultimately, it becomes more convoluted to resolve and sometimes the patient gives up before they can have their problem handled. Please don't let this be you. If you are experiencing pain after eating we recommend speaking with your doctor to determine if you are at risk for gallstones. If you experience severe pain after eating that does not go away, you would want to go to your local emergency room. Your doctor will be able to diagnose any issues with your gallbladder and make appropriate treatment recommendations. Should You Have Your Gallbladder Removed? Having a vital organ removed is not the best way to recover and remain healthy. Your Medical Doctor will have nothing else to offer you other than surgery, as that is the "standard of care" for gallbladder problems. This will never solve the problem and will only give you new problems going forward that your Medical Doctor will not tell you about before the surgery. And unfortunately, once you have the surgery, you will have a life-time of medication and other complications to deal with, just to be able to digest your food. This is one of those things you will not be told about before surgery. I hope that is abundantly clear. I came to Dr. Huntoon regarding concerns with my digestion and learned that after having had my gal bladder removed at the request of my medical dr. I came to find out that the removal of the gall bladder is what caused all of my other ...More"I came to Dr. Huntoon regarding concerns with my digestion and stomach upset. And I learned that after having had my gallbladder removed, at the request of my Medical Doctor, I came to find out that the removal of the gallbladder is what caused ALL of my other health problems. I now understand the importance of keeping my gallbladder and would ask anyone being told to remove their gall-bladder to please speak to Dr. Huntoon first." What Should You Do Instead of Having Surgery? The good news is, you can always go and have the surgery. There are plenty of doctors willing to do that. What you may want to consider before going down that road is to have a consultation with Dr. Huntoon so you can keep your gallbladder and resolve the dysfunction you may have by addressing the underlying reason for having gallbladder issues. After having suffered a major Gallbladder attack back in November 8, 2016. I was told by three different specialists that I needed to have it removed immediately ...but its removal may cause my kidney to not function properly and that was the risk I had to take and deal with for the rest of my life. I was referred to Dr. Huntoon by my brother-in-law to explore alternative methods. After 5 months of care with Dr. Huntoon I was Gallstone free and my gallbladder function was fully restored without surgical intervention of any kind. In fact, after returning to the specialists for follow up...they were amazed to see that I had no sign of gallstones or sludge in my gallbladder. I proceed to explain about Dr. Rick methods but they were tossed aside with a simple "that's great that it worked for you" comment. They believed that the ultrasound machine might have misdiagnosed me...or had a malfunction. Meanwhile I had two different tests with two different machines. Dr. Rick not only helped me with the gallbladder but my whole digestive system and taught me how to read the signs my body gives after eating specific foods. He introduced me to a whole new world of self control and understanding the way my body functions and heals. Take advantage of Dr. Rick knowledge he has much to offer his patients. He is personable and caring and has helped many members of my family and friends. Thank you Dr. Rick for helping me heal and saving my gallbladder!! What Should You Do If You've Already Had the Surgery? If that is the case, then you already know the truth about having had the surgery. You will need to take a couple of whole food supplements to support your system to do its job, now that the organ has been removed. This will be whole food enzymes, whole food gallbladder support, whole food liver support and most likely a probiotic. The specifics you will need are based on your individual health imbalances and must be determined through a consultation and evaluation. If you still have your gallbladder, a better option would be to do a Liver/gallbladder flush and to discuss a way of dealing with the repressed emotion. This requires a different approach, but like my mom always said, "Different isn't wrong, different is just different." Always liked that and have always remembered that. Working with a Holistic Chiropractor who can help you discover the underlying imbalances within your gallbladder would be prudent. This is the best, most complete way to deal with gallbladder imbalance, dysfunction or disease. A proper liver/gallbladder flush under the guidance of a holistic chiropractor is an excellent first step to curing the underlying conditions affecting your gallbladder. This cleansing would remove the need for surgery, and the permanent loss of an internal organ. While this surgery is very common it can have lifelong side effects. So the next time you are told, "you have gallbladder issues" or "you need your gallbladder removed and it is one of the most common surgeries done in the U.S.," simply smile and say, "Thanks for the diagnosis Doc. Now I will go deal with the imbalance and be able to keep my gallbladder." After all, it is your decision maker and we wouldn't want you to have that taken away from you, would we? If you are having trouble with your Gallbladder, please feel free to call me at 845-561-2225 and we can discuss all your options to keeping your gallbladder and leading a healthier life. It would be my pleasure to help you to better health. If you've already had your gallbladder removed, still call me and I will help you restore as much health and balance to your system as possible, so you do not have to take medication for the rest of your life.